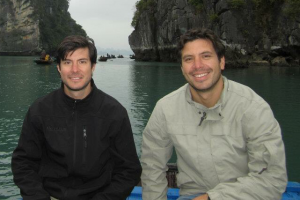 Brothers Diego Espinoza (MBA ’10) and Sergio Espinoza (MBA ’13) shared everything growing up: a crib, a room, even friends. In their 20s, their mother passed away unexpectedly, and the loss was compounded when the brothers were separated for the first time. Diego, the elder by a year and 10 months, left their home country of Costa Rica to finish his undergraduate studies in Kansas. He learned about Wake Forest through a friend in Costa Rica and from research on employer-recommended universities. Diego quickly became impressed with the depth of knowledge his professors brought to the classroom and the opportunities to travel to Japan and Nicaragua with Wake Forest professors and classmates. While earning his MBA, he also interned with global agribusiness company Syngenta in Greensboro. While Diego was in school in the United States, Sergio was watching his elder brother’s adventures from afar. “Diego and others were telling me great things about Wake Forest University,” Sergio said. Sherry Moss, professor of organizational studies, connected Sergio with students who were planning to work in the financial industry. “Hearing their stories and experiences helped me decide that Wake Forest was the best option,” Sergio said. A capstone moment came when Sergio landed a summer internship at Morgan Stanley’s private wealth management division in New York City. “Wake Forest helped me open the door that ultimately led me to work at Morgan Stanley full-time, allowing me to fulfill my dreams,” said Sergio. Today, Sergio is a Morgan Stanley financial advisor, Diego serves as international sales manager for New Way Trucks, a leading truck manufacturer in the waste management industry, and the brothers live just two miles apart in Atlanta. The Wake Forest University School of Business brought them back together, and they are determined to stay close as they continue building careers that leverage all they learned through the School of Business. They both credit the School for instilling valuable lessons in building culture and meeting challenges in the workplace. For Sergio, the program’s Pro Humanitate emphasis underscored the responsibility to give back and leave a positive impact on the world around him. For both brothers, Wake Forest proved an invaluable resource for allowing them to use their gifts.